Every city has that area of town in which they tend to avoid, because it’s got that...reputation. You know what I’m talking about. For so many years, 118th Avenue has carried that burden, a neighbourhood that was stricken with higher levels of crime and poverty, which always seem to go hand in hand. But, that was then and this is now, and now things are better...a lot better, depending on who you ask. In fact, it’s not even called 118th anymore, going back to it’s original name, Alberta Avenue (between 109th Street & Wayne Gretzky Drive), after nearly a century as 118th. 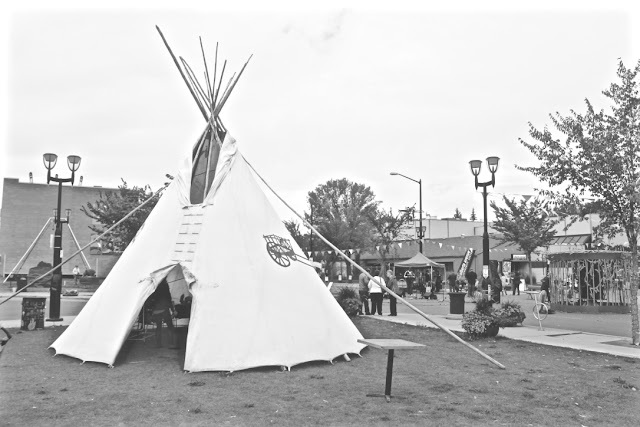 A temporary tipi set up during the 2015 Kaleido Festival along Alberta Avenue. Sure, there are still pawn shops and cheque-cashing joints “plaguing” the area, but Alberta Avenue has long evolved from just that, thanks to some dedicated locals who want to prove to the rest of Edmonton that this isn’t such a bad neighbourhood after all. A revitalization plan has seen plenty of positive outcomes so far, such as shop owners reinvesting in their infrastructure, flowers and plants popping up along the streets, murals created on alleyway walls, more public space, and of course the Kaleido Family Arts Festival, Arts on the Avenue, and Deep Freeze events that have sparked new life and attitudes in and around this North Edmonton street. One of the strip's most popular spots is The Carrot Community Arts Coffeehouse. Of course, Alberta Avenue is also home to Rexall Place, the home of the Edmonton Oilers from their NHL conception in 1979 to the end of the 2015-16 season. It also houses Northlands, K-Days, that giant baseball bat (don’t ask! ), and some pretty cool spots, such as the Nina Haggerty Centre for the Arts, the Stollery Gallery, the Carrot Community Arts Coffeehouse, Koultures Fine Dining, Coliseum Pizza & Steak, and El Rancho Spanish Restaurant.